These are the necessary steps that will determine whether your company can receive the EthSI mark. The certification process begins at the time the formal application from the applicant institution is received. From this point onwards, the Ethical Finance Observatory contacts the organisation to continue with the other steps of the process. The Ethical Finance Observatory will request a set of details and documentation from the applicant institution about the different aspects to be analysed. This information will be complemented with the information the Observatory can obtain via other channels. A report including the most important information will be drawn up and checks will be made that the applicant institution meets the requirements to obtain the mark. This report will be checked with the applicant institution to avoid inaccurate information. 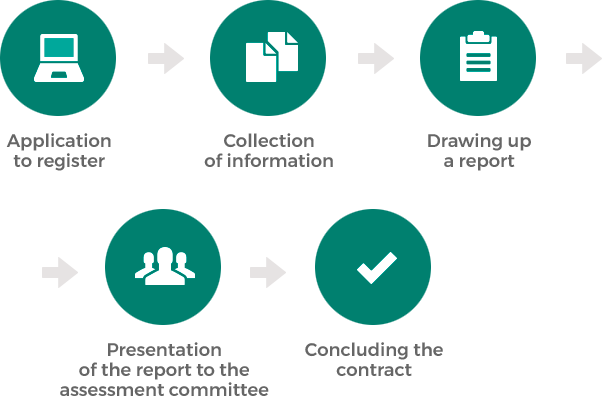 In the course of the working session of the Assessment Committee, the report will be presented and a decision on whether to award the certificate will be made. In this same session, the Assessment Committee can suggest improvement considerations for various aspects of the applicant institution, which will be taken into account in future renewals and during annual monitoring. If granted the EthSI mark, the decision will be notified to the applicant institution and the parties will, by means of a contract, formalise the certification or registration of the EthSI mark and the payment of the corresponding fee. EthSI certification lasts for one year and must be renewed following the same procedure. Throughout the year, monitoring will be carried out to take into account the recommendations proposed by the Assessment Committee.